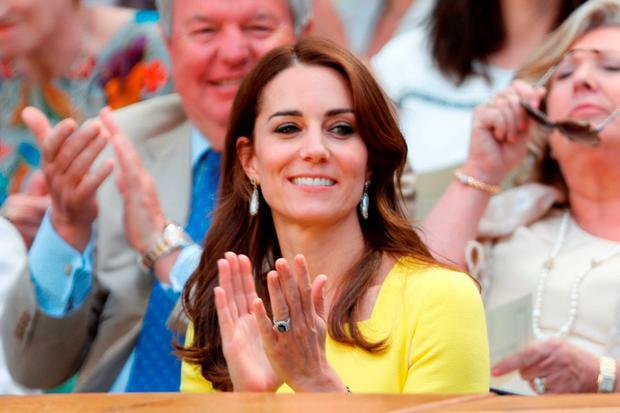 She's a famous sports fanatic, so nothing was going to keep Kate Middleton from Wimbledon this year. While her sister Pippa and brother James have both enjoyed premium seats in the royal box at the tennis championships over the last week, the Duchess of Cambridge attended solo this year. After wowing the fash pack with her daring look at the Natural History Museum the night before, Kate proved she was a creature of habit wearing a yellow Rosanda Illincic dress she last wore during her New Zealand tour in 2014. She accessorised with a pair of Givenchy sunglasses. In previous years, she's attended Wimbledon with her husband Prince William or her siblings, but this time around she was spotted chatting with Gill Brook, the wife of All England Club chairman Philip Brook. We may have grown accustomed to her modest royal style, but it was her shoulder baring dress at the Victoria and Albert Museum the night before that got the world talking. The mother-of-two's white knit midi length Barbara Casasola dress might have looked demure on the outside, but its off the shoulder cut means she's straying from royal tradition which requires covering up for official engagements.